Welp, if a well-decorated lair doesn’t draw a witch out of hiding then there’s some truth to the rumor that she’s kicked the bucket. I’d say kick the cauldron, but those things are heavy. Time to assume the worst! If the witch was murdered then it’s up to us to find out who did it. I mean, what if they’re after me next? Or another employee. That’s almost as bad! It ain’t easy finding a Frankenstein that’s willing to work a 9 to 5. Anyway, if our witch has gone to the afterlife, why don’t we try doing something witchy to lure her out? ...I think it's time to hold a seance, how about you? 1. 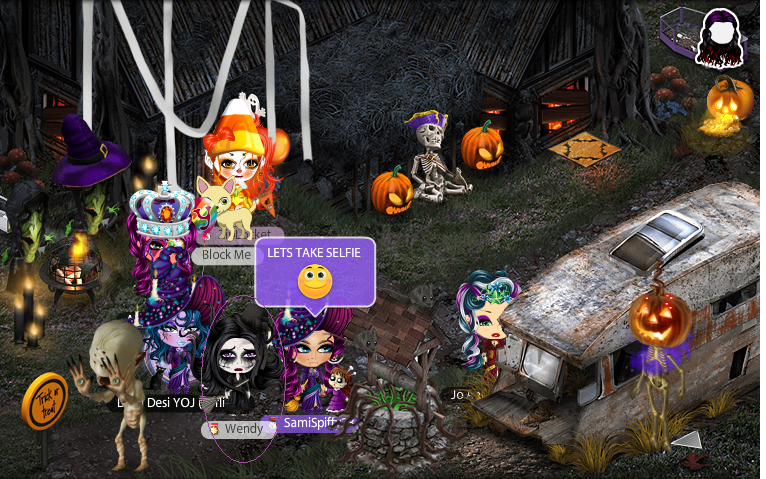 Host a seance in a Halloween-y lookin' room by creating an event in the Parties and Discussion category. 2. If you were one of the lucky winners of our Feature Fanpage Challenge, make sure you're holding your Glowing Ouijaboard HH! What's a seance without one? 3. Gather your friends and try to summon Wendy. If she shows up at your seance, try to grab a screenshot and share it here for everyone to see! Alright, get going! Your chance to summon Wendy begins now and ends at 5:30 pm EDT today, Wednesday October 18th. Wow she actually spoke a lil word...what does it mean?? She loved it at Ricky's and played around!! Great place too Ricky!! Woot. So much fun. Nice meeting you MsVixen. Great party too! Ty Vix! U as well. Well that didn’t work. Maybe we just aren’t witchy enough. I mean, thanks for tryin'... I guess. Whatever. Seems like Wendy made a couple of appearances here and there, but that doesn't help ME much. We have to get to the bottom of this, for the sake of my precious park. Wait. WAIT! Hold up. What's this? ...Looks like paw prints. Tiny, little paw prints. I know Wendy had a cat. Looks like the seances may have aroused her cat's curiosity, at the very least. Bah, I'm done thinking about this. I don't have time. If you figure anything else out, let me know. I am having a seance now! Please come if you want to. Pennywit wrote: Well that didn’t work. Maybe we just aren’t witchy enough. I mean, thanks for tryin'... I guess. Whatever. I'm going out on a limb here and am going to view this message as clues. The word WAIT in red? Wait is another word for stop and since it's intentionally written in red, could that mean Red Stop Sign? I went to where you find a red stop sign and if you look closely, the stains in a portion of the street (actually many more places in the street) could look like tiny paw prints. I know it's a long shot, but I don't know what else to do with the message. Wait.WAIT! Hold up. What's this? I like your idea and now im wondering about the thing in the email and if its related "Remember that old, dilapidated home tucked away in the corner of YoWorld? Well, it appears as though some new tenants have arrived. These strange individuals have been doing some very suspicious things lately. Bizarre noises and bright flashes have become a regular occurrence, so much so that the area around the house has become a dark and disturbing place. 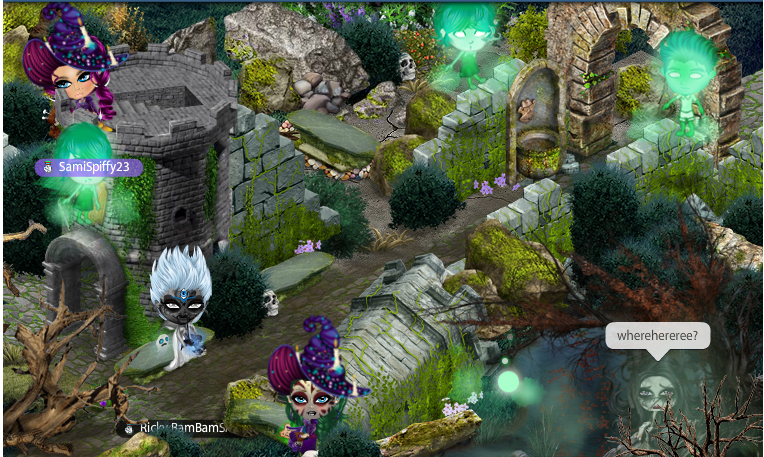 Help us uncover what’s happening over at the Coven House during YoWorld’s Salem Sorcery theme!" I have not found the house on the map but if anyone gets any more info let me know! Ember (153690198) wrote: I like your idea and now im wondering about the thing in the email and if its related "Remember that old, dilapidated home tucked away in the corner of YoWorld? Well, it appears as though some new tenants have arrived. These strange individuals have been doing some very suspicious things lately. Bizarre noises and bright flashes have become a regular occurrence, so much so that the area around the house has become a dark and disturbing place. 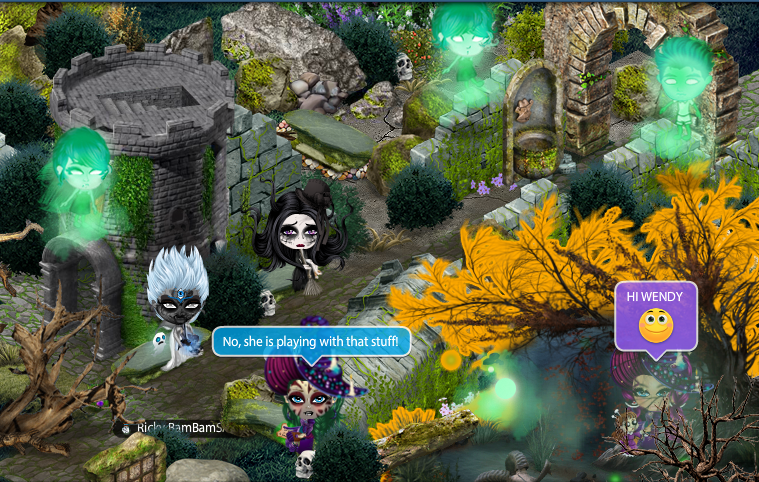 Help us uncover what’s happening over at the Coven House during YoWorld’s Salem Sorcery theme!" Thanks for the newsletter blurb reminder! The only thing I found different on the map is to the right of Alton Towers. The Adams Family NPCs are there in front of a spooky tree and bushes and they've moved a haunted type bench to the left of the tree, but you can't see beyond that. I didn't find tiny paw prints, but maybe there's a clue there I'm missing. I'm saddened to hear of the passing of Wendy. She was really a great cook when she wanted to be. I got so hungry, that I said a simple travel spell, and went back home to Romania. I whipped up a cocktail in my ritual room, and levitated in her memory. RIP, Wendy! Hoping to catch the killer! Any word on the winners of the contest? The winners have been picked and you would have gotten the prize you can see in forum who won.